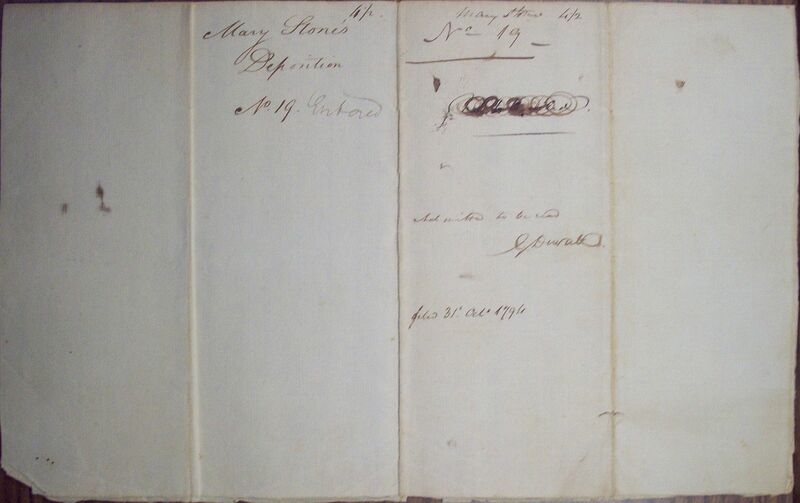 The Deposition of Mary Stone of Charles County aged fifty six years, in a suit now depending in the General Court between the representatives of David Stone late of Charles County deceased of the one part and a family of negroes claiming their freedom who call themselves by the name of Thomas of the other part, the said Mary having been first duly sworn upon the holy Evangelists of Almighty God saith and Deposeth that she was well acquainted with the said David Stone and Catharine Stone mother in law to the said David, and that the said Catharine Stone and David Stone during her this deponents acquaintance with them were of oftentimes at variance and that frequent disagreements and quarrels happened between them and this Deponent verily believes that the said Catharine Stone during the said quarrels & disagreements would have discovered and made known any thing tending to injure the said David Stone, and had the said Catharine known, the said petitioning negroes to be entitled to their freedom, or had she suspected it, she would have published and declared it to gratify her resentments against the said David, but this Deponent never heard the said Catharine mention or hint at any thing to that purpose. 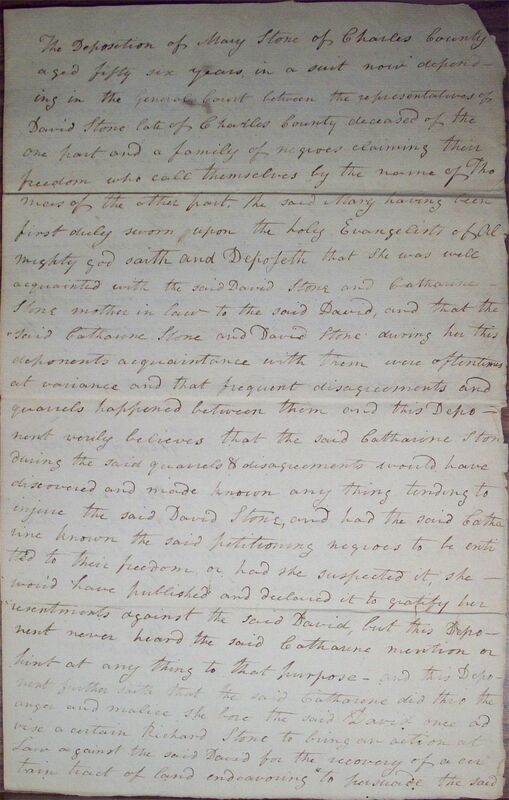 And this Deponent further saith that the said Catharine did thro the anger and malice she bore the said David once advise a certain Richard Stone to bring an action at Law against the David for the recovery of a certain tract of land endeavoring to persuade the said Richard that he had title to the said tract of Land. 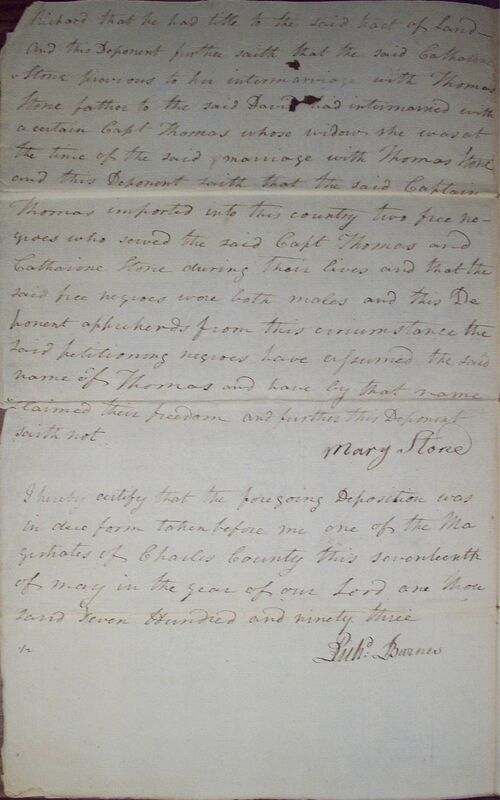 And this Deponent further saith that the said Catharine Stone previous to her intermarriage with Thomas Stone father to the said David had intermarried with a certain Capt Thomas whose widow she was at the time of the said marriage with Thomas Stone and this Deponent saith that the said Captain Thomas imported into this country two free negroes who served the said Capt Thomas and Catherine Stone during their lives and that the said free negroes were both males and this Deponent apprehends from this circumstance the said petitioning negroes have assumed the said name of Thomas and have by that name claimed their freedom and further this Deponent saith not.